As expected, the Board found that the project would likely cause “significant adverse environmental effects” on the endangered southern resident killer whales, and the Indigenous cultural use associated with them. They also found that greenhouse gas emissions from project-related marine vessels would be significant, and that a worst-case oil spill would be significant (duh). Despite all this, the NEB decided that these significant effects and risks were justified in the circumstances by the economic benefits of the project. The major problem with this conclusion is that the NEB refused to re-examine those economic benefits, even when many intervenors called on them to do so. Indeed, chapters 12 (Need and economic feasibility) and 13 (Financial matters) in the NEB reconsideration report are two of the chapters that were recycled and reused from the original report. This should be of grave concern to all Canadians who now own Trans Mountain, after Kinder Morgan decided to abandon it because it was uneconomic. The underlying economics and need for the project have fundamentally changed since it was first applied for in 2013, when oil was well over $100 per barrel and before the Paris Climate Agreement was a reality. Plus, the NEB did not consider it worth noting that oil transportation economics have also changed, and will soon be disrupted further. New fuel standards regulations will decrease the demand (and price) for sulphur-heavy oil sands products, while Very Large Crude Carriers (VLCCs) in the new Louisana LOOP terminal will make Aframax tankers (like the ones loading up at the Trans Mountain terminal) comparatively more expensive. Combined, these two factors will make Canadian oil sands less economic. The 2015 evidence relied upon by the NEB was prepared by Muse Stancil, the same company that advised the Canadian government on the purchase. That evidence was needed after Steven Kelly, the author of Kinder Morgan’s original economic evidence, was appointed to the NEB, raising concerns about bias and conflict. The Muse Stancil report relied on a 2015 supply outlook from the Canadian Association of Petroleum Producers (CAPP), which is now hopelessly out of date, with almost half of the oil producers from 2015 having now left the oil sands. Muse Stancil also assumed that the Canadian dollar would remain on par with the US dollar; that other pipelines would not be built; that increased supply would secure a higher price in Asia (not true); and that all of the bitumen in the pipeline would be subject to the price differential. In reality about 20% of production is impacted by the differential. As a result of these faulty assumptions, Muse Stancil concluded that TMX would result in billions and billions in economic benefits for Canada. Of course, the NEB could, and should, have looked at how the economic evidence had changed since Muse Stancil’s 2015 report. But unfortunately, it did not. It is likely that Muse Stancil recycled similar assumptions in its rushed work advising the federal government prior to the purchase, but we can’t know for sure because the report was heavily redacted when it was released via Access to Information laws. That meant that the PBO relied primarily on Kinder Morgan’s securities filings, among other things, which do not reflect the impact of the quashed certificates and subsequent delay, nor do they include an updated construction cost estimate. The PBO report, released in February, found that Canada paid the high end of the value for Trans Mountain; that the claim it will result in 15,000 jobs is overblown; and that a cost overrun or delay (now both likely), would render the project completely uneconomic – even with the outdated 2015 CAPP supply outlook. Why would the federal government want to keep economic information secret when it has stated repeatedly that buying Trans Mountain from Kinder Morgan was a good idea? If the benefits were so obvious, then why would the government structure the crown corporation in such a way that makes it impossible for the Canadian public to know how their money is being spent, and whether it is a good investment? The answer is likely that they don’t want the public to know at all, leaving the ‘public’ conversation to be driven by Alberta’s $23 million propaganda campaign. Without the press conferences and fanfare of the Trans Mountain Expansion reconsideration report, the NEB quietly released its decision on the Incentive Toll Settlement Agreement for 2019-2021 for the existing Trans Mountain pipeline on March 5th, 2019. This decision will have consequences for the future of the pipeline expansion, and could represent more than $2 billion in further subsidies for the TMX project. How can this be? In short: regulated pipeline companies like Trans Mountain set their tolls (the amount they charge the oil producers to use the pipeline) based on the ‘cost of service’ or the cost of owning and running the business, plus a profit. However, the toll proposal before the NEB assumed the value of the original Trans Mountain line was $1.6 billion, rather than the $3 billion that Canada paid for the existing assets last year. Further, the toll settlement agreement does not include the cost of capital – ie. the cost of borrowing the money ($6.5 billion) to finance the purchase. That means for the next three years, the tolls collected by Trans Mountain will not pay for the full cost of running the business, resulting in a shortfall of about $2 billion. The difference will likely be covered by taxpayers. The NEB justified this approach because it did not believe anything changed when the government of Canada became the owner – in other words, the price Canada paid did not change the NEB’s valuation of the pipeline for the purposes of determining the cost of service. The complex crown corporate structure also allowed the NEB to find that the interest costs were not borne directly by Trans Mountain ULP and LP, and therefore should not be included in the cost of service. This could make it even harder for the federal government to sell the project to a private buyer at anything approaching the price it paid, as the government has stated is its intention, simply because the tolls that were recently approved do not capture the paid value of the original Trans Mountain line, nor the full cost of capital. This could have a domino effect. If the TMX is approved by Cabinet, Trans Mountain Corporation will have to provide its customers with an updated cost estimate, resulting in updated tolls. In theory, the money coming in from those tolls should cover the full cost of service, meaning they would also make up the shortfall of the recently approved tolls. If the new tolls are too expensive for the customers to stomach, then they could cancel their contracts, and send Trans Mountain into a death spiral, resulting in a stranded asset. So, to sum up: the NEB justified the marine shipping impacts of the Trans Mountain Expansion (which it still found to be significant and adverse), based on an economic case that is outdated and out of touch with reality. The Board then made matters worse by baking in tolls for the original pipeline that will make it harder to sell it back to the private sector. The NEB has shown that it can recycle old reports and reuse stale evidence – but its outdated conclusions and stale economic evidence are more suited to the garbage bin. Following the NEB’s redo recommendation, the federal Cabinet now has 90 days to make a decision, or give itself an extension. In that time, the federal government needs to complete meaningful consultation with all 117 First Nations impacted by the project, or risk further lawsuits like the one that quashed the approval last time. Finally, the federal government’s multiple hats – as the pipeline’s owner, regulator (NEB), enforcer of laws like the Fisheries Act or Navigation Protection Act, as an intervener in the review (through federal departments), and as a fiduciary for First Nations whose reserves are crossed by the pipeline – creates a very complicated landscape for the federal Cabinet to make a fresh decision on the Trans Mountain Expansion as it is required to. All of this suggests that this issue will be back in court before too long. 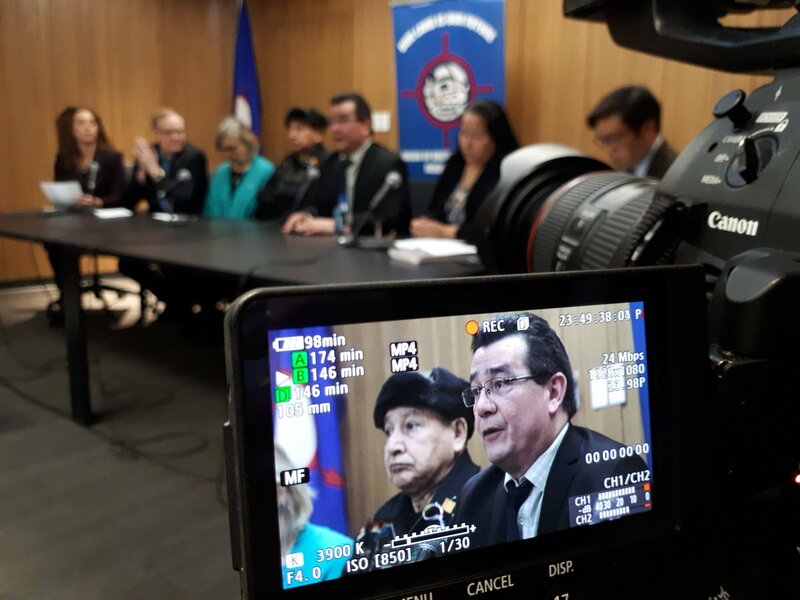 Top photo: Press conference with Indigenous leaders and environmental organizations following the release of the NEB's reconsideration report, Feb. 22, 2019.